While my disease is doing better each day and I am feeling better with every treatment, there are still some things that will never go away. I will never be “cured” in the traditional sense. I’ve tried so many things and so many doctors and been poked and prodded and second opinions? Yeah, I’ve got 20. After denial came anger. Because being a single mom, wasn’t hard enough? Having two teenage boys that are like emotional tornadoes wasn’t hard enough? Having a career and moving to the mountains wasn’t hard enough? The fact that those were all “choices” I’ve made and lupus wasn’t? Yeah, that realization really pissed me off. I own the mistakes I’ve made. I don’t just own them, I reference them in times of despair to remind myself how far I’ve come, and yet still have to go. I’ve managed to turn those moments into the best times of my life. Every one of those choices above that made my life hard, made me cry and laugh sometimes in the same breath, made me who I am today. Strong, independent, intelligent, seeking new adventures and doing the things people said couldn’t be done! Finally I had the meltdown that had been building up for years. Building up since that day I was diagnosed. I realized I did in fact need help. I realized I couldn’t do this, everything I am and aspire to be, on my own. I didn’t know the whats or the whos, I just knew it was finally OK to say it out loud. I have lupus. And dammit if I couldn’t change it, I would own it. Now I am not a religious person, but I do believe in the power of suggestion, of positive and negative energy, and that we all have a path we are on in this life and we learn through the suffering of ourselves and those around us. We become humbled. We seek and in return give love and comfort to those who ask. I looked up at the stars, then I closed my eyes to meditate, and I asked for strength. To say I was overwhelmed would be an understatement. “Speechless” doesn’t even give it justice. Offers of wheelchairs, places to go for used ones, lupus support groups, offers to pay the co-pay by complete strangers! It turned out someone I already knew had one in her garage, of which I am graciously and humbly accepting. But I didn’t know because I never even asked. The next weekend the boys and I went to San Francisco and I was invited to speak to budding songwriters. We went to dinner, and I went outside to get some fresh air. I was greeted by sounds of a saxophone player and it took me back to a time, October 2007 I believe, when I had been standing in the same spot, listening to a saxophone player. “I was here almost 10 years ago, and you played Miles Davis for me and I gave you a $50 bill,” I said. 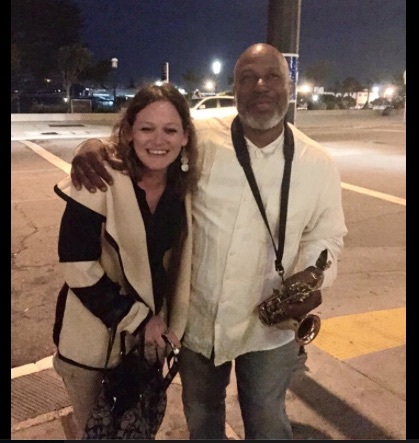 Bridget and the saxophone player. And I never laughed so hard. He asked how my boys were, and he commented on my cane, then I don’t know why, but we hugged like old friends. We talked for another 20 minutes and when I turned to leave, he grabbed my head, kissed the top and began to pray. He asked that the boys and I be given strength. Which is when of course I completely lost it. I began to sob, almost hysterically. But he held me tighter, and prayed harder. And I accepted it. Not because my faith was the same as his, very far from it in fact, but because our spirituality was. We are all human. We all have to ask for help and if we are any good at being human, we will all give someone help at some point, too. I don’t know who I thought “that girl” was, but I know who she is now. You see finally, after anger came acceptance. Acceptance that while yes, I do have this disease, equally, if not more important, was that I am not alone in this fight. Having lupus has made me realize that the person I truly aim to be is not one who is jaded and made “hard” by something completely out of my control. It is to accept that maybe out of control is OK. Maybe being someone who treasures receiving love as much as giving it is even better. Being a lupie warrior, just like being a mother, will never be easy. And maybe that’s the best part. The Mighty is asking the following: Share with us an unexpected act of kindness, big or small, that you’ve experienced or witnessed in an everyday place. Check out our Submit a Story page for more about our submission guidelines.